The festival has announced its improvement plans, including over 3000 metres of preventative drainage. As predicted by the Met Office last year, Download Festival 2016 experienced huge downpours, leading the site to become waterlogged. However, this year the world's premiere rock event - which takes place from 9 - 11 June 2017 - has announced huge improvement plans, which are set to cope with everything from heavy rainfall to congestion. According to a press release, the festival - which is hosted at the spiritual home of rock at Donington Park in Leicestershire - now has 3000 metres of preventative drainage, alternative traffic routes and improved disabled access. Download also boasts a 400-strong Dog Squad to aid festival goers whatever their needs, and will see some stages relocated entirely. Find out more about the improvements here. 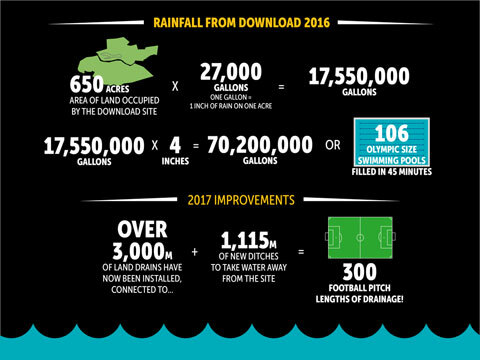 Last year's festival saw over 70 million gallons of rain fall across the weekend, which is the equivalent of 106 Olympic sized swimming pools. The improvements will see their drainage quadrupled, while 1,115 metres of new ditches have been added to take water away from the site. This year's Download will see System Of A Down, Biffy Clyro and Aerosmith headline the Friday, Saturday and Sunday night respectively.